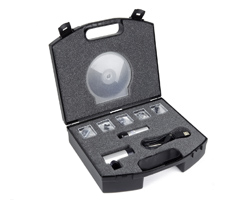 The kit consists of a 35mW 660nm Lyte-MV laser diode module which is supplied with six interchangeable optics which allow the user to project a wide range of projections including uniform lines, cross, dot matrix, circles and a grid. 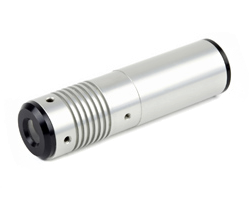 The user adjustable focus allows the user to focus the output beam to a fine spot or projection depending on the fitted interchange optic. A robust heavy duty clamp which has parallel and vertical adjustment and allows the user to aim the laser in any required direction or angle is also included. The kit is provided in a rugged and attractive plastic carrying case designed to securely store all the kits components. The laser is powered via a USB port on a computer or USB hub without the need for any external power supply. The included software provides a user friendly graphical interface which allows the control of the level of the laser output powered from factory power set to off. Alternatively the output can be modulated via a sine or triangle wave with the signal type or modulation frequency simply controlled via a menu in the control software which programs an on board function generator. The output can also be switched on and off via TTL with the frequency controlled from the software. PWM can also be used at a fixed frequency with the duty cycle also controlled from the software.